I love wreaths. All kind of wreaths. And I have been making wreaths for as long as I can remember. But one specific kind of wreath has been haunting me lately. Ever since I saw Donna’s dreamy, beautiful ‘white trash’ bedroom, I have been dreaming of that bedroom. 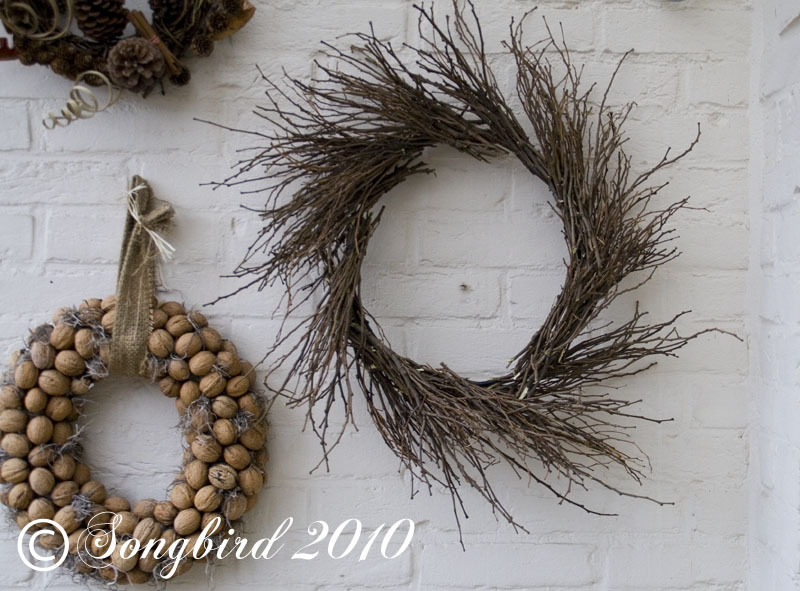 And I loved that spiky, twiggy wreath she had hanging on her funky headboard. Style-queen Melissa of The Inspired Room has another version on her mantel (this is a Christmas picture obviously). I was inspired and I wanted a twig wreath. Badly. Then I came home from Barcelona to this. A big heap of cut up branches and twigs on our terrace. My Love had been pruning trees and cutting up the leftovers so they would fit in our compost bin. My head started spinning, what if….. So I told him to leave that heap there because I had plans for it. Next thing I started putting little bunches of twigs to the side. I couldn’t help laughing at myself while I was sitting there sifting through this heap of garden waste. Had I finally gone over the deep end, was this crafting thing getting out of hand, was there hope for me yet. Ah well, I did it anyway. I thought making the wreath would be a quick and easy project. This is how it turned out. Oh My Gosh, this is the most sad excuse for a wreath I have ever seen. Total bust! It looked hideous like something a bird that had been sipping to much Vodka would make as a nest. It isn’t round! It isn’t even! It is UGLY! Hmm, back to the drawing board. Better, much better, not perfect yet, but a good start. It helped that I found a smaller ring base that was actually round and that I took a bit more time in arranging the twig bundles. For now my twiggy wreath is hanging on my porch waiting for another round of touch ups and then I’ll have to find a better place for it. I think there is hope for my twig wreath yet. oh, yes…your second try is much better…very cute actually…what a great idea…thanks for sharing Marianne!!! Neat wreath Marianne. I've collected wild grapevine and made wreaths, but never a twig wreath. I might have to give this a try. Lovely Marianne! I love that you kept on trying….it's beautiful. I've been admiring that bedroom too! Your second try is very good! Sometimes it takes several tries to get something the way you envision it. BTW I've eaten almost all the chocolate you sent me! It's sooo good! You made me laugh with the sipping vodka comment! I think your second try was much better and you know what they say, practice makes perfect! Ha, you made me laugh out loud. You are brave, indeed! 🙂 Great job! I'd say that your twiggy wreath came along nicely – good job. Thanks for sharing. Given the pile of scraps, you made a masterpiece 🙂 The walnut wreath next to it is also beautiful. Are they hot glued? To Sugar Bananas: Yes I made the walnut wreath last year. It is made out of walnuts from a friends tree hot glued to a straw wreath. Ja, ja ik ben hier al uuuuuuren, maar steeds word ik afgeleid…dan weer telefoon, mail, kids enz. maar nu ga ik toch eindelijk ook een commentaar schrijven. Haha, wie had dat gedacht dat je zoiets moois uit die berg snoeiafval zou kunnen maken! Hier ligt het bewaren van takken een beetje gevoelig ahum. Daarom vandaag maar weer eens gewoon Paastakken gekocht maar dan wel van zo'n 2 meter hoog. Daar heb ik ook de paastags van vorig jaar ingehangen, remember?! Hihihi, moest natuurlijk aan jou denken! Vroeg me af of je 'where women create' nog ontvangen had. Maar waarschijnlijk is die bij de Somerset Life die ik nog zou krijgen. In mijn post over de pitchers zit bij de kindertheeserviesjes een link van mijn slaapkamerpost, hoewel ik denk dat de eerste slaapkamer in deze post wel meer op jullie beider smaak aansluit. Mocht je 'rozen' willen dan is het misschien goed om te weten dat Ikea weer Rosali dekbedhoezen heeft. Misschien tijdelijk, wie zal het zeggen. Ik vind je tweede krans heel leuk! Vooral als je hem op zichzelf ziet. In vergelijking met je voorbeeld zou je misschien wat minder twijgjes bij elkaar moeten doen dus gewoon alle takjes spreiden. Dit zeg ik alleen omdat jij het voorbeeld erbij laat zien. Krans 1 zou je moeten bewaren tot Sinterklaas! Een paar penen erop, wat cadeautjes en/of chocolade figuren en je hebt een perfecte wie zoet is krijgt lekkers wie stout is de roe krans. Misschien moet je er wel een ring achter zetten voor de stevigheid. Fijn weekend! Je maakt prachtige dingen en zo inspiratievol!!! Ik blijf maar kijken en bewonderen,zo mooi!!! Just found you and love your blog. Looking forward to more of it, my new friend. LOL!! Oh I enjoyed this one! I think your 2nd wreath turned out amazing! But your first one? It wasn't quiiiiite Songbird quality I daresay. In fact, I looked at your pics first before reading. Note to self… read WITH the pictures! I was wondering what I'd say to this one. ha! The second is wonderful, but I kind of like the first try too. It could be nice filled in with blooms. By the way, what was the look on your husband's face when you told him to leave the pile of trimmings? I think I've probably seen the same look around here. The second one looks wonderful!! Thanks for sharing! Hahahaha white trash bedroom… it's GORGE! I don't blame you for giving it a whirl. Thanks for leaving a kind comment at Twice Lovely and leading us to your lovely blog. I love them both and love that you spent all that time working so hard to get it right! Next you will have to tackle one of those cool twig light fixtures! Have you seen them? The wreath is beautiful. Number one looks like me when I wake up in the morning! LOL! I had to laugh at your loopy vodka-drinking bird nest wreath! I was kind of thinking it reminds me of Charlie on pain meds. Sort of "drawn to one side." The others are indeed a vast improvement. And I pat you on the back for being so innovative and creative, Marianne! How cool is this? You made your own wreath???? Amazing. Hey, shoot me an email with your address will ya?